UV is now a popular water treatment system for indoor pools of all sizes. For many years, chlorine or bromine treatment has been the most common method of treating water in swimming pools in order to achieve water that is clean, clear and safe to swim in. There is now a new system that is gaining in popularity with pool owners and installers and that is UV treatment. UV not only destroys chloramines, which are the unpleasant by product of chlorination and the compounds that actually cause the ‘chlorine’ taste and smell of a poorly maintained pool, it also acts as a disinfectant process in its own right. There are virtually no microorganisms that are immune to UV and so chlorine levels can be reduced by almost two thirds – down to 0.5ppm. That means that a UV treated pool is using far less chemicals and therefore will also need less backwashing, which will help reduce water and heating costs. UV treatment systems are based around a cylindrical, stainless steel container inside which is a UV lamp protected by a quartz sleeve. 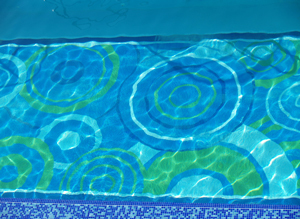 The pool water is simply pumped through the chamber and is dosed with UV energy as it passes through. There are two types of UV lamp used; low pressure and medium pressure. The UV works to treat the water in a number of different ways. One section of the UV spectrum breaks down the chloramines by a process known as photolysis. Shorter UV wavelengths produce hydroxyl radicals from the water itself, which are powerful oxidising agents and attack the chloramines in the water. The UV radiation is also a highly efficient natural disinfectant that kills bacteria, viruses and moulds by damaging their DNA. Some microorganisms can repair themselves after a dose of low pressure UV but medium pressure UV provides a more permanent solution. Low doses of chlorine are left in UV treated systems to provide a back-up level of disinfectant. It all sounds very ‘scientific’ and complicated, but in operation a UV treatment system is simple and effective. The pool pump circulates the water through the UV chamber as well as the pool filters. Over time, organic residue can build up on the quartz sleeve that protects the UV lamp – it gets dirty. In order to make sure that he water gets the right dose of UV, an automatic wiping system keeps the sleeve clean. That wiping system also cleans the lens of a small camera in the chamber that measures the amount of UV light and provides readings to ensure that the system is operating properly. The lamp itself will have to be changed once a year in the average system. UV treatment systems come in different sizes so that they can be matched to the size of the pool and the volume of water to be treated. A UV treatment system is energy efficient and will certainly reduce the overall running costs of any indoor pool. Even in a busy, high bather load, commercial pool, UV treatment will produce clearer water than chlorine alone and the air in the poolroom or enclosure will be better with no unpleasant chloramine smells or eye irritation and it achieves this in an environmentally friendly way. For residential swimming pool and spa owners, the UV options now available from leading water treatment specialist Triogen include cost-effective TR2 units which save on both capital and running costs while improving water quality. Cost-saving features of the Triogen TR2 range include automatic shutdown to conserve power in the absence of flow, as well as a robust, hardwearing, low-maintenance construction. Their reactor bodies are made from UV-inhibited polymeric materials, which are totally resistant to corrosion, and their UV lamps have a life of 18 months. The compact units have been designed for quick and easy fitting, so that installation is inexpensive. Each comes complete with union adapters, a pressure gauge and a pressure switch, ready for simple connection to a suitably protected power supply. While affordability is a key issue for owners, the main benefit of switching to UV disinfection is improved water quality, as the TR2 unit controls algae, chlorine-resistant organisms and other unwanted life forms, without having any harmful residual effect or leaving any by-product in the water. The UV system when used in tandem with existing sanitising treatments, such as salt water chlorination or standard dosing will mean a substantial reduction in the chemical levels needed. For owners, this means a better pool or spa experience in addition to reduced running costs. If you would like some specific advice on UV water treatment and would like to find an appropriate pool professional in your area, there is a link at the top of this article that can get that process started.